One of the things that I missed when budgeting was the cost of moving some of the utilities. While none of the amounts are showstoppers, they do start to add up. And the fact that they haven’t been showstoppers is more down to luck than judgement. There were two electric meters on the property. One in each of the properties. The meters belong to the electricity supplier (e.g. EDF, E.on, British Gas) and it is usually free to get a meter removed. We removed the meter from number 8 and continue to use the meter in number 10 to power the cement mixer etc. There was third – there was a meter in one of the outbuildings, but we have never had a bill for this one and we had it removed before knocking down the building. I talked to the electricity board and no one seems to know who owns it. So now it languishes in the long grass in the back field. The existing meter in number 10 needs to move to the new utility room, but unfortunately that will have to wait as it isn’t built yet. I reckon we can move it around October/November time. When it does move, we would like the cables put underground rather than being attached to the front of the property (which they are at the moment). In addition to the changes to the single phase supply above, we also need to install a 3 phase supply. This is to power the ground source heat pump. We are fortunate that there is a three-phase supply on the pole right outside the property. Again this needs to go to the new utility room (still not built) with a three-phase meter. This should go in the same trench as single phase supply. On the basis that we dig the trench and laying the duct to the utility room, the cost is £2,600 plus 5% VAT. All of the work that relates to the change of supply is completed by Northern Power Grid. Plus, of course, there is the cost of digging the trench. Once the order has been accepted, you are given an MPAN number that can then be given to the electricity provider of your choice who will install the meters (one for the single phase supply and one for the three-phase supply). I am currently shopping around for the best electricity provider. More updates on this later. The existing electricity supply comes in via overhead cables. The cables are then attached to the front of the house. The plan is that there will be put underground and brought round into the new extension. 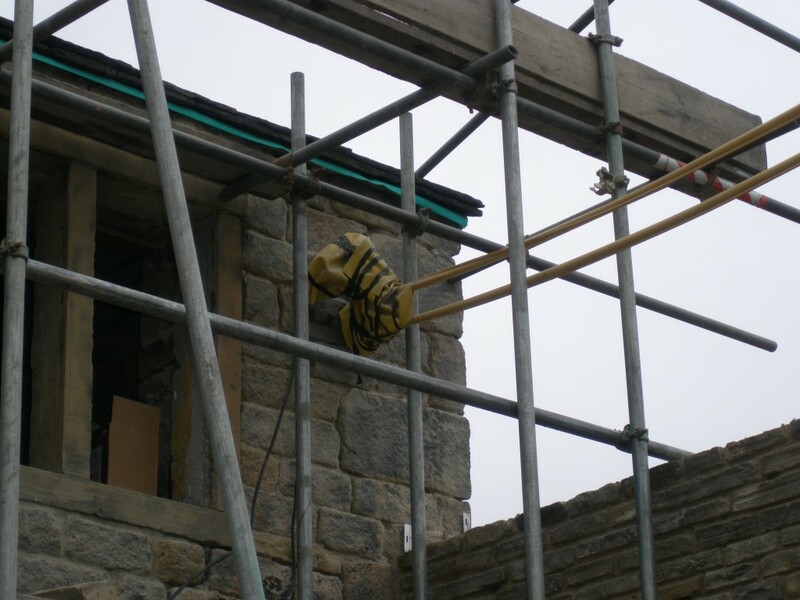 The yellow sheaths are to protect the guys working on the scaffolding. We asked our friendly VAT consultant (Stephen Fennell) for some advice and got the following clarification on the questions we had on VAT issues. If you have questions around VAT, you can reach Stephen via his website: www.sef-vatconsultants.co.uk. 1. Given that we are converting two cottages into one, I assume that we are eligible for the reduced rate of VAT (currently 5%). Is this correct? 2. We are converting the barn on the end of the property into residential use. This attracts a VAT rate of 0%. Is this correct? 3. When converting the barn, it will be extended. What rate of VAT applies to this element of the build? 4. The proposal is to build a triple garage with home office space above. What level of VAT will this attract? If this were part of a ‘new build’ of a domestic dwelling the construction of the garages would be zero rated as per the domestic dwelling so adopting the same principles if the garages are constructed as part of the conversion process there is an argument that they could be supplied at the reduced rate of 5%. However the Vat man/woman may well argue differently and insist that the build of a non domestic stand alone building should be standard rated at 20% Vat. Your builder may have an opinion on this but just to be sure we could apply for a categoric ruling from HMRC. 5. If different parts of the build (even if completed at the same time), attract different levels of VAT how is this handled? The builder would be obliged to provide separate ‘Tax Invoices’ to show the work undertaken & the relevant vat rate applied. 6. If we qualify for the reduced rate of VAT, we have to prove this to our build who will then only charge us at the reduced rate. What form of evidence will satisfy HM revenues and custom? The ‘onus’ is on the builder to provide the relevant evidence as to the correct Vat liability and this is usually in the form of planning consent, plans & correspondence from the Land Registry. In truth a Vat Inspector would loook at the narrative on the builder’s invoices to you and form his/her own opinion as to whether the builder has applied the correct Vat liability and then take issue with the builder if there is any doubt. 7. Certain energy saving technology has a VAT rate of 0%. How is this handled when dealt with via the main contractor? As mentioned above i’ve attached PN 708/6 Energy Saving Materials for your information and this gives a comprehensive outline of the Vat treatment of the various energy saving technologies and their treatment for Vat purposes. Much depends on whether the they are being provided as anxcillary to the major supply or whether they are the major supply. The Public Notice seems to cover every eventuality & scenario. Given that we are converting two cottages into one, I assume that we are eligible for the reduced rate of VAT (currently 5%). Is this correct? We are converting the barn on the end of the property into residential use. This attracts a VAT rate of 0%. Is this correct? When converting the barn, it will be extended. What rate of VAT applies to this element of the build? The proposal is to build a triple garage with home office space above. What level of VAT will this attract? If different parts of the build (even if completed at the same time), attract different levels of VAT how is this handled? If we qualify for the reduced rate of VAT, we have to prove this to our build who will then only charge us at the reduced rate. What form of evidence will satisfy HM revenues and custom? Certain energy saving technology has a VAT rate of 0%. How is this handled when dealt with via the main contractor? Update: You will find the answers here. One thing is for sure – VAT is complicated. And VAT on building renovations is one of the more complicated topics. Two other things we can be sure about: firstly, I am not a tax accountant so make sure you get proper advice (there are a number of specialists around who can help you with this); and secondly, trying to correct the situation after the wrong amount of VAT has been charged, seems to be very difficult. So it would be wise to get it right from the start. The standard rate for VAT (or Value Added Tax) in the UK is 20%, so this can add a considerable amount to your renovation. So it is well worth investing some time in this subject. Not matter how boring it may seem! There are exceptions to the standard rate where either a zero rate of VAT is due or a reduced rate (currently 5%). But this all depends on the time of renovation that you are undertaking. You can find more information (a lot more information) on the HM Revenue & Customs site here: http://www.hmrc.gov.uk/vat/sectors/builders/construction.htm. Once you start looking into the material you will find that the definitive source is “VAT Notice 708: Buildings and Construction”. But before you get to carried and download it, you should note that it is 120 pages long! Building a new house attracts 0% VAT. The VAT is paid on goods and labour as the house is built and then a SINGLE claim is submitted to the Revenue and Customs to reclaim the VAT. Converting a non-residential building into a dwelling also attracts VAT at 0%. There are a number of categories of construction/renovation that attract a reduced rate of VAT. Converting a residential building into a different residential units – for example combining two cottages into a single house. The method of reclaiming the VAT here seems to be different – you provide evidence to the builder that you are eligible for the reduced rate of VAT and then you get charged (for labour and goods) at this reduced rate. Thus there is no VAT to be reclaimed at the end of the project. This sounds like a better approach, however, many builders do not seem to be aware of the rules and once the VAT is paid, it is very difficult to get it back. There are exceptions to these rules, and it is not possible to get a reduced rate of VAT on everything (for example, architects fees attract the standard rate of VAT), so it would be wise to fully understand the rules before you embark on your project. We had some questions when we looked into the details and the questions are here.